Kelvin Langmead has said the death of former Cobblers assistant manager Andy King is ‘heartbreaking’. Ex-Town skipper Langmead took to Twitter to pay tribute to King, who died from a heart attack on Wednesday morning aged just 58. 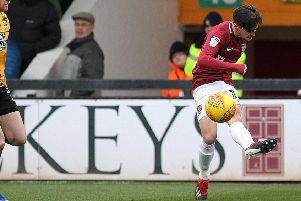 King was number two to Aidy Boothroyd at Northampton and Langmead worked closely with him from when King joined the club in 2011, to him leaving in January 2014 following the appointment of Chris Wilder as manager. Langmead was one of a string of ex-Town players that were among that 1,000s to post touching tributes on social media following the news of King’s passing. Darren Carter said: “Deeply saddened to hear of the passing of Andy King aka Kingy. Shook me to my core, such a great man who never failed to make me smile. Lewis Hornby, who along with Tozer, Morris and Carter was released by Northampton earlier this month, said: “RIP Kingy. Helped me an awful lot and was always there when it mattered. Goalkeeper Dean Snedker, who is now a Brackley Town player, added: “Sad to hear about Andy King, was a great man! RIP”, while Michael Jacobs also paid tribute. Blair Adams, who spent four months on loan at the Cobblers in 2012, added: “Gutted to hear Andy King has passed away. The Cobblers also issued a statement on their website ntfc.co.uk that read: “Northampton Town Football Club are deeply saddened by the news that Andy King has passed away at the age of 58.